QATAR – The water production stage at the Umm Al Houl Power Plant has been completed and the power generation phase should soon be complete as well. The plant is one of the largest power and desalination plants in the Gulf region, with a water production capacity of 618,268 m3/d, of which 227,124 m3/d is produced using reverse osmosis and 2,520 megawatts of electricity per day. The plant is expected to increase the country’s existing water and electricity capacity by 25 percent. The official opening of the plant is scheduled for October. JORDAN – Minister of Water and Irrigation Ali Ghezawi has revealed that the ministry is embarking on a set of ambitious water projects that will be implemented between 2018 and 2025. At a cost of nearly $5 billion, these projects will help to tackle the country’s water shortages. The Red Sea-Dead Sea Water Conveyance Project and the Red Sea Desalination Water Project are part of the scheme. Support from the international sector for Jordan’s water infrastructure is insufficient, according to Minister Ghewazi. The country is currently home to 1.3 million Syrian refugees and experiencing immense pressures on its water and wastewater systems. Ghewazi stated, however, that desalination directly supports Jordan’s plan to achieve water security. PAKISTAN – Senate Chairman Sadiq Sanjrani has inaugurated the Gwadar port’s highly anticipated desalination plant. The Chinese Overseas Port Holding company built the plant, which will produce 1,154 m3 water per day. Chairman Sanjrani called the plant “a gift from the Chinese” that utilizes the region’s natural resources to help “change the destiny” of its people. Last year, President Mamnoon Hussain identified the project as part of a broader initiative to help reduce unemployment and poverty in the province. SOUTH AFRICA – The City of Cape Town expects desalination plants at Strandfontein, Monwabisi and the V&A Waterfront to go online later this month. The completion and operation of the plants was delayed by several months because of funding issues and a testing process that took longer than expected. The Monwabisi and Strandfontein plants are each expected to produce 7,000 m3/day, while the V&A Waterfront will deliver 2,000 m3/day. 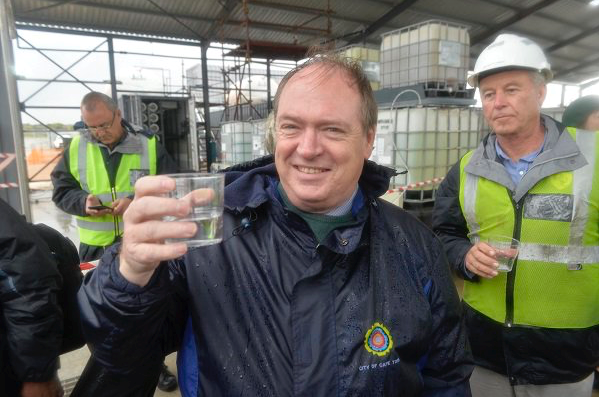 Cape Town Deputy Mayor Ian Neilson at the launch of the Strandfontein desalination plant. “Water production stages of Umm Al Houl plant over’”, gulf-times.com, May 20, 2018. 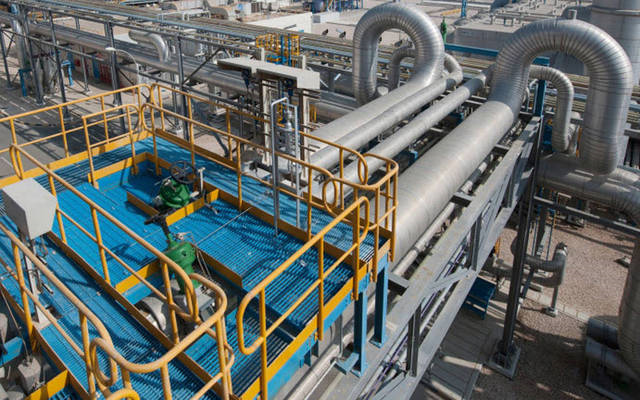 <http://www.gulf-times.com/story/593319/Water-production-stages-of-Umm-Al-Houl-plant-over> accessed May 22, 2018. Hana Namrouqa “Jordan seeks self-reliance in water sector- Ghezawi”, jordantimes.com, May 21, 2018. <http://www.jordantimes.com/news/local/jordan-seeks-self-reliance-water-sector-%E2%80%94-ghezawi> accessed May 22, 2018. “Senate chairman inaugurates Gwadar desalination plant”, tribune.com.pk, May 16, 2018. <https://tribune.com.pk/story/1711142/1-senate-chairman-inaugurates-gwadar-desalination-plant/> accessed May 22, 2018. Masroor Afzal Pasha, “Gwadar Port, CPEC will help reduce poverty from Balochistan: President,” Pakobserver.net, December 31, 2017, < https://pakobserver.net/gwadar-port-cpec-will-help-reduce-poverty-balochistan-president/> accessed May 22, 2018. “Three Cape Town desalination plants to deliver water in May”, cbn.co.za, May 20, 2018. <https://www.cbn.co.za/news/three-cape-town-desalination-plants-to-deliver-water-in-may.html> accessed May 22, 2018.